Are there many mosquitoes (zancudos) in Costa Rica? Costa Rica is near the equator which means that some destinations have mosquitoes (also known as zancudos in Spanish) throughout most of the year. It is likely that you encounter them on the coasts, especially in the Caribbean region of Costa Rica. However, mosquitoes are rare in other parts of the country due to low temperatures in the night. You will probably not see many of them in the Central Valley, Monteverde or other places in the Highlands of Costa Rica. Being dinner for a mosquito should not be one of top 10 things to do while in Costa Rica on a honeymoon. DEET is no doubt the most effective ingredient to combat mosquitoes. The higher the DEET content is, the more effective. Although you probably don’t want to use a content higher than 30% on children. You can also spray DEET on your clothing and proves a quite effective way sprayed on the brim of a hat to keep mosquitoes from dive-bombing your face. Interesting fact: if you go to Corcovado National Park, DEET will not help you. Purrujas (no-see-ums) are not affected by DEET. You will have to use Skin So Soft to keep insects away. After DEET, Picaridin is a synthetical compound that comes highly recommended by the World Health Organization for the protection against mosquito-related diseases. Another repellent that is effective to repel these pests are Mosquito coils when burned, called “alas.” However, be forewarned, their smell is not very pleasant and will stick to clothes and hair for days. DEET and Picaridin are both safe to use for pregnant women. DEET may be advertised as the more effective preventative product against mosquitoes, but it does have its downsides. The heavy ingredients used in DEET products can, after frequent use, cause skin irritations and even neurological effects. If you will be traveling for a longer period of time and need to use bug spray on a frequent bases, consider more natural alternatives to keep yourself safe. A good way to go is the use of essential oils. One of the most effective after DEET and picaridin, is Lemon Eurcalyptus Essential Oil. Although effective, it is only half as much so as DEET but with a higher concertation of PMD, it can increase in effectiveness. Most zancudos in Costa Rica are active at dawn and dusk. They can definitely ruin your sunset beach picnic, leaving you scratching instead of enjoying the beautiful views Costa Rica has to offer. However, they can dine at any time of the day. Mosquitoes are drawn to the carbon dioxide emitted from our mouths. So they love when people are sitting, eating, and chatting. If this is an activity you enjoy doing, consider doing it with a good amount of DEET while wearing long sleeves and pants. Many preventatives that work in other countries are not very effective in Costa Rica; for example, small clip-on devices, or ultrasonic mosquito repellents. However, large powerful fans directed towards the user work great. The mosquitoes (and other insects) are unable to fly through the wind stream. 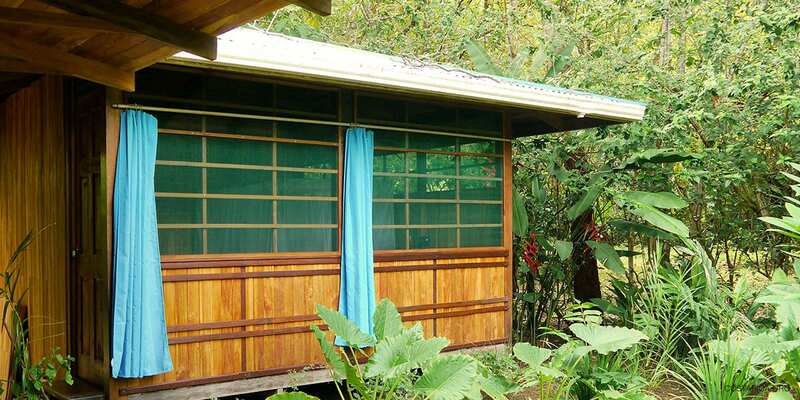 If your accommodation doesn’t have screens, shutting your windows at dusk is highly advisable, and in the Caribbean region of the country, mosquito nets are popular. If you don’t need to go outside during dusk and you are near standing bodies of water- don’t. Avoid wearing perfumes and wear long sleeves and pants at night. Remember, it’s better to be hot and a bit uncomfortable than eaten alive. Remember to be safe from the Mosquitoes in Costa Rica. Only 1 in 5 people who are infected become sick. For more information directly related to health questions and concerns. We recommend checking the CDC’s website for any destination you plan on visiting. This is a link to the CDC’s information page on Costa Rica. There has been a lot of recent information about the Zika Virus in the news. We are very fortunate that this has not been much of an issue here in Costa Rica. However, there are some precautions you can take. Mosquitoes in Costa Rica that carry the virus tend to be prevalent in undeveloped areas and need wet conditions. During this time of year, the dry season, many regions in Costa Rica do not have a mosquito population to be concerned about. Dengue and Chikungunya – Present in Costa Rica? But the good news is that Costa Rica’s government keeps a permanent campaign against Dengue, focused on accurate information distribution, and well-equipped medical centers along the country for disease control. Some of the symptoms of Dengue include nausea, joint pains, and headaches. Also keep in mind that a case study prepared by Bloomberg company, published on the World Economic Forum website, ranks Costa Rica as the healthier country in the region, even above Mexico and Chile. The analysis takes into account information from various sources such as the United Nations, the World Bank, the World Health Organization, relating to 145 countries worldwide and Costa Rica is located 24th, and first in whole Latin America! You will also be happy to learn that there is no risk of Yellow Fever in Costa Rica. Another risk in Costa Rica is the Chikungunya transmission, caused by the bite of the female mosquito infected with the CHIK virus. The risk is higher during the wet season and the mosquito has been known to bite usually in the mornings or afternoon in turban and suburban areas. Sometimes Chikungunya is asymptomatic. Symptoms usually show 3-12 days after being bitten by an infected mosquito. Symptoms can include a sudden fever and muscle and joint pains as well as headaches, fatigue, vomiting and nausea. Most people recover fully but the joint pains can last for several weeks or months after the bite. Even though the mosquitoes are a nuisance they do play a vital role in the animal kingdom. This is a little-known fact but these nasty bugs actually provide the world’s supply of chocolate. The mosquitoes pollinate cocoa plants. This is where we then pick the beans and refine them into the great dessert we all love. It is interesting to see how even a bug we all hate has a place in the natural world. On Cocoa farms, the mosquito population is deliberately increased for a better harvest. Although we may not like to see Mosquitoes in Costa Rica we certainly do love the other aspects of nature and Costa Rica holds so much of it. Make sure to explore the various National Parks and Reserves just teaming with Wildlife!